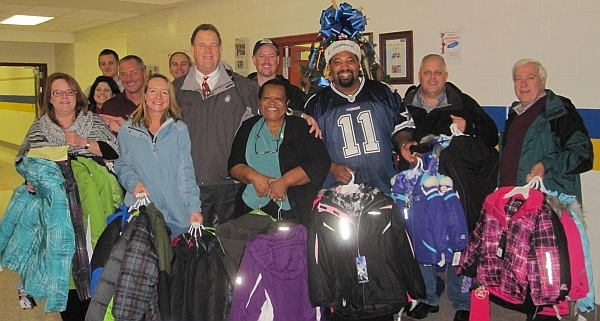 This year, the COATS FOR KIDS program expanded by adding a second school, Portlock Primary. Over $11,000 worth of coats, gloves, and warm weather clothing was delivered to Thurgood Marshall Elementary and Portlock Primary on December 15th, 2010. These two schools shared the dubious distinction of 100% enrollment in the free or reduced meal lunch program making them our most needy schools in the city. Working with the guidance counselors in each school, and our corporate partner Kohl’s Department Store, we were able to provide much needed warm clothing just before new snow fell for over 180 kids. Our COATS FOR KIDS program is Co- Chaired by Rotarian’s Gardner King and Doug Davis. The funds are raised from our members, and community partners. Our hope is to expand the program next year again.